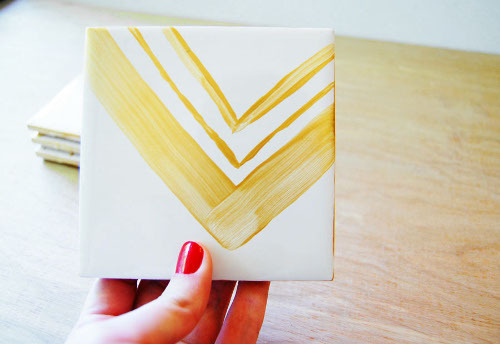 This project uses ceramic tiles from the hardware store and are super cheap – 13 cents each! Their bargain price makes up for the higher cost of the paint. The paint is pretty cool though; you paint it on, bake the coasters, and then the paint is enameled and dishwasher safe! 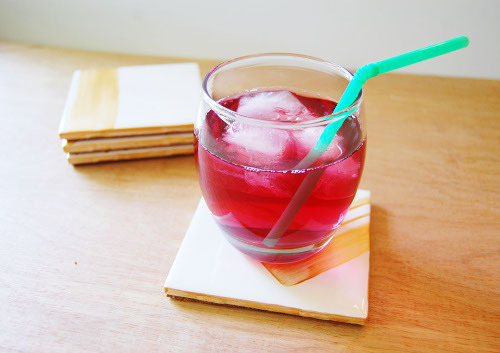 Using your paintbrush, paint a design of your choosing onto your coasters. 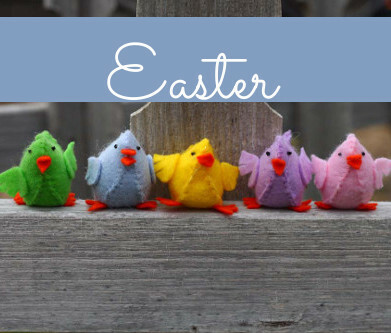 I free-handed my patterns, as I like the hand painted touch of imperfection. 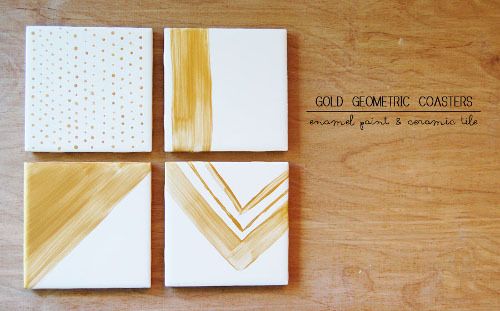 😉 Carefully paint the edges of your tiles with gold paint. You may need multiple coats on the edges for full coverage. Let the paint dry for 24 hours, then place your tiles into a cold oven — this allows the tiles to heat up with the oven, preventing cracking. Set your oven to 300º F and let the tiles bake for about 40 minutes (the paint bottle says 35 minutes, but does not account for preheating time). Cut four 4″ squares from your cork. 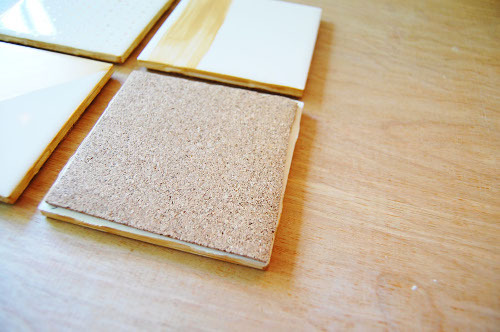 When your tiles are finished baking and have cooled, apply your craft glue to the backs of your tiles. Firmly press your cork onto the tile back, making sure all edges are adhered. When all your tiles have been back with cork, stack them, turn them upside down, and place a heavy book/object on top to be sure the glue sets evenly. 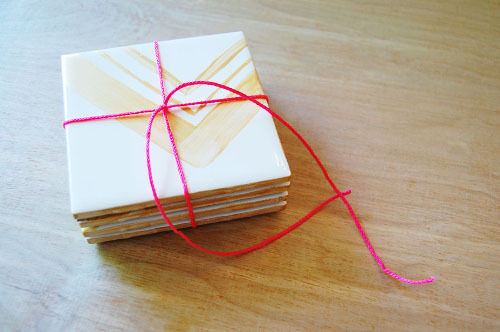 You could make a matching set if you wanted, or you could create a stencil or straight lines using tape. Each tile is like a mini canvas for you! 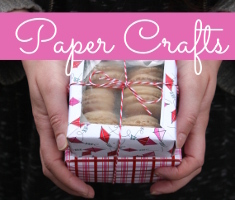 I think these would make a cute housewarming or wedding gift for someone, too! 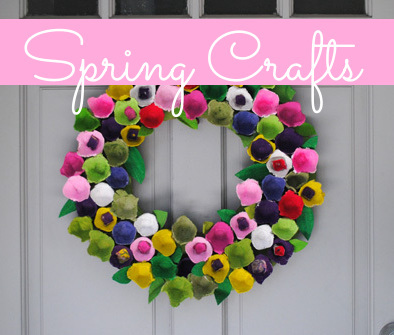 This entry was posted in Crafts, DIY gift ideas, Home Decor, Kid's Crafts and tagged DIY gift ideas, Painting, Techniques and Mediums on May 30, 2013 by Monica. You have totally given me inspiration for holiday gift ideas! I was thinking these could be decorated with subject related “art” for teacher gifts.